It’s time to hit the high seas for a bit of R & R. We’ll visit exotic places, taste tantalizing cuisine and meet fascinating people. Make a point of meeting Casha Coindexter Manypenny, heiress of the Manypenny Meat empire, and her son, Sonny. Don’t miss the opportunity to rub elbows with royalty when you are introduced to Duke Stone Opalopoli and his lovely bride, Gemma. Other interesting passengers include Ponder Porterhouse, the Cold Cut King and Poppie Pendergrass, Sonny’s future wife and Casha’s present aggravation. Activity Director, Windy Gale Zephyr will keep us entertained aboard the U.S.S. Mystery of the Sea. 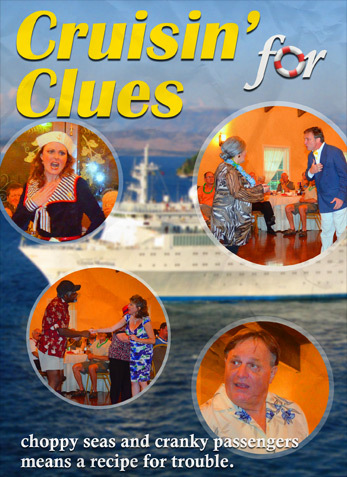 With so many colorful characters on the cruise, this will be a memorable vacation. Let’s hope we avoid choppy seas and cranky passengers, for that is a recipe for trouble. In the event of a shocking crime, it will be up to you and your table of fellow sleuths to discover who could commit such an evil deed. So, think of a clever name for your table, er, detective agency and listen carefully for clues. At the designated time, your agency will be asked to formulate a question that your delegated chief detective will ask a suspect. Once all tables have completed their questioning, each detective agency will submit a solution sheet indicating “who done it” and why. The first agency to name the most correct motive and culprit wins. Mama Manypenny knows that money talks and she wants her cash to be heard loud and clear. Married to Benny Manypenny for over sixty years, she has been a widow for the last two. She now holds the purse strings to a fortune, but there are always strings attached to any benevolence she bequeaths. Will she be able to buy her way out of what is ahead for her, or will her account soon be overdrawn? Sonny is the son of Casha and the late Benny Manypenny. He worked in the family meat business and then ran Sonny’s Steak House until he got bored. He has spent the last few years living off the profits and trust fund set up by his father. He now spends his time gambling away his inheritance, and with his long-time girlfriend, Poppie. Is it time for Sonny to lay claim on the family fortune, or will someone else beat him to the grub steak? Poppie has been Sonny's girlfriend for longer than she cares to admit. She thought she'd be Poppie Manypenny a long time ago, but Sonny wants to wait for Mama's blessing. Poppie recently started working as a receptionist at the law firm of Chase, Chase and Sioux, whose motto is: "We've never seen an ambulance we can't outrun." Will she need to call on her bosses before the night is over? Has time run out for Poppie? Will Sonny finally pop the question? Will she take her dough to go? A former flight attendant, Gemma expected to live a fairy tale life when she married Duke Stone Opalopoli, but the "they lived happily ever after" part of the story hasn't come true … yet. She spends her days dreaming up ways to con her admirers out of their money. Tonight she will take her scheming to a whole new level. Will Gemma, at last, take hold of the jewels, or is she about to lose her sparkle? Duke, Duke, Duke, Duke of …. Stuvinia? The heir to a gem mine, Stone tries to keep himself shrouded in mystery, so that he can attract potential benefactors who revel in the idea of rubbing elbows with royalty. With no marketable skills, he has honed his ability to run a con with perfection. He also claims to have been an officer in the Stuvinian Navy. Will his story hold water? Will he make a splash this evening, or will we discover that he’s one big drip? Ponder read in the paper that Casha's husband, Benny Manypenny had passed away leaving her with a large fortune. This prompts him to shuffle back into Casha’s life to see if he can get some of the money that he believes he was cheated out of by Benny years before. Believing that revenge is served better cold, he is planning on making up for lost time. Did you ever wonder where the Porterhouse steak got its name? Will the Cold Cut King finally get what he deserves? Activities Director, Windy Gale Zephyr, has always fancied herself as a bit of a sleuth. She reads murder mysteries and was once an extra in a Sherlock Holmes movie. Will Windy enjoy smooth sailing, or will we soon wave bye-bye to our perky sailor?